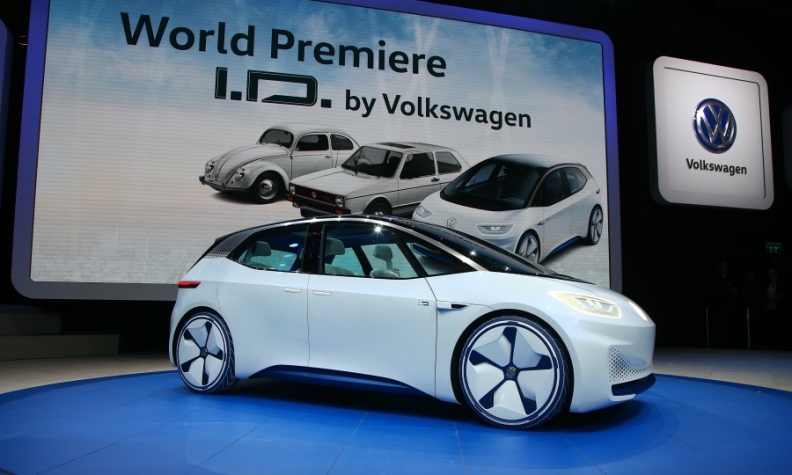 VW first standalone EV will be based on the the I.D. concept (shown). HAMBURG -- Volkswagen Group's supervisory board will likely approve more investment in the automaker's Zwickau plant in eastern Germany to ramp up production of electric cars there, sources said, as the carmaker strives to create a mass market for zero-emission vehicles. The automaker plans to spend more than 20 billion euros ($23.5 billion) on electric mobility by 2030, including costs to develop battery models and upgrade factories. With its nearly 9,000 workers, Zwickau builds Golf and Passat models alongside Bentley Bentayga bodies in white. It is scheduled to begin production of VW’s first dedicated EV, the I.D. hatchback, in 2020, according to Automotive News Europe's European car assembly plant map. The combustion-engine vehicles could be shifted to under-utilized German factories in Wolfsburg and Emden to make room for EV production at the site in Saxony, three sources close to VW said on Tuesday. "Things are moving in this direction," one of them said. A spokesman for VW's operations in Saxony, which also include an engine plant in Chemnitz and a site in Dresden, said Zwickau has been earmarked to build an electric model but declined to elaborate. A spokesman at VW's Wolfsburg headquarters declined to comment. Until it admitted in 2015 to cheating on U.S. diesel emissions tests, VW had been slow to embrace zero-emission cars. Under its "Roadmap E", VW now aims to offer an electric version of each of its 300 group models by 2030. VW's supervisory board will meet on Friday to sign off on management's capital and development spending targets for the next five years. At the previous budget round a year ago, VW pledged to cut group spending on factories, equipment and technology to 6 percent of automotive sales by 2020 from 6.9 percent in 2015. VW is struggling to fund a strategic shift to electric cars and new mobility services while grappling with its emissions scandal which has cost it around $30 billion so far.